Rob Kearney this, Rob Kearney that. His name has pretty much dominated the overall reaction to the Ireland team named Thursday evening. It probably doesn’t help that his position is first on a standard rugby team sheet. Nor does it help that some Irish fans who like to express an opinion appear predisposed to criticise Leinster players and former coaches whenever they get the chance. But this time even I have to admit I raised an eyebrow when I saw his name in the starting lineup, because a combination of persistent injury and standards below those which he would set for himself leave me preferring Isa for the full-back role at Leinster, which means it goes without saying that I wouldn’t have him in my Ireland XV. Here’s the thing though...he’s there. And one thing we know about Joe Schmidt’s Ireland is that he picks his teams based on what he sees on the training ground in accordance with his overall plan and maybe we haven’t seen many YouTube moments from Rob lately (and in fairness I could possibly have written a few similar opening paragraphs about Simon Zebo) but he certainly has both the experience and the ability for an occasion like this. So perhaps our concerns going into this match shouldn’t be so much about personnel...if I were to have one over-riding worry about our ability to get the job done in Chicago it would have to do with Johnny Sexton’s hamstring. Maybe it is just a “tightness” as we’ve been told, or maybe it was something more...but whatever the truth, that’s a part of the body which doesn’t really have a whole lot of respect for the rugby calendar - it will be ready when it’s ready and I for one am going to be on tenterhooks every time Johnny has to extend it in the opening stages. That’s not to say I have absolutely no faith in Joey Carbery on the bench, by the way...it’s just that if Sexton is forced from the park too soon it would have been effectively the waste of a player and a substitution in a match where we will positively need every bit of advantage we can get. But let’s look past the negatives we’re all instinctively looking for on our side of the equation. Say Johnny is fit for a full 80 minutes and the likes of Rob and Simon give the kind of performance we know they are capable of. Can we make history? Absolutely. The All Blacks are going to do what they do. We have to leave them worry about that - I’m not going to mention even one of their players in this preview. One thing I will be looking for more than anything else from Ireland on Saturday will be readiness. It’s pretty much Joe’s trademark. Here’s the plan lads...go out there and execute it and you’ll have every chance. Central to our hopes is our “Henshayne” centre pairing. I really don’t understand how little appreciation many seem to have for the role they have played in Ireland’s successes under this coach. Yes, maybe it is a risk to put so much stock in just two players in such a physical sport. But given they have offered so much for us, particularly defensively...and also given we have witnessed how much our structure suffers when they are not there, I can totally see why they are arguably the first names on Joe’s team sheet when both are available. Plus, they now have the added benefit of some fresh input from Andy Farrell under their belts. Another with a seemingly specific role is Jordi Murphy. Personally I’d have started with van der Flier as Jordi is more versatile across the back row but again, we have to assume there is a plan in place so it remains to be seen what that is. Elsewhere in the pack there is plenty of scope for strong carrying and solid set pieces and we will need endless quantities of both from start to finish. There’s a lot of inexperience on our bench, of that there is no doubt. 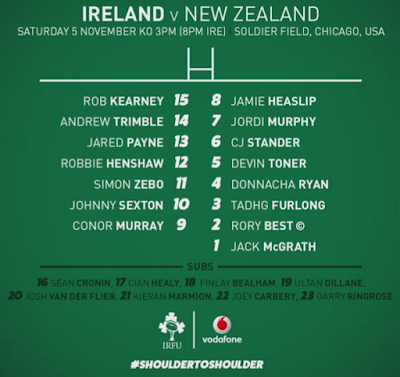 But what can also be said is that all of them have shown they can perform at the highest level when called upon, and the All Blacks’ playbook on the likes of Bealham, Dillane, Carbery and Ringrose is bound to be rather thin so don’t think for a moment that Joe will be reluctant to use the entire matchday squad...the physicality of the modern day game pretty much demands it anyway. For me, our first priority is to make a mockery of the bookies’ 23-point line, one which has actually gone out from 21 since he starting lineups were announced. I’m not saying a three-converted-try margin is impossible mind you...take our history with this lot, their own current form, plus the fact that their test team has been playing together since the beginning of August and there is certainly logic behind that score. If it were down to me, however, I’d take that number 23 and pin it to the Irish dressing room wall. Are we going to let those expectations beat us today? Or does our own 23 have something to say about it? Of course we’re going need super-size helpings of accuracy and yes, also luck to make this American adventure a successful one. And I can’t in all seriousness make my official prediction one whereby we win...I’m going to say All Blacks by 12 though we could well be ahead on the scoreboard after the half hour mark.